Oh dear me, yum. There’s an column in the works about small local meat farmers, but I had to share this one teeny picture of our Biancalana Pork Growers pork shoulder roast the other night. Dave and Cody Biancalana are a father and son team (dad owns a popular Eugene garage) who started raising a pig as a hobby on their land in Springfield, and suddenly, they had a pork growing operation. The pork is available at the tiny Saturday farmer’s market in the parking lot shared by Mazzi’s and Hideaway Bakery, and it’s delicious. Their pepper bacon? I can’t even think about it because my drool will short out my keyboard. Retrogrouch and I are working on all the cuts of meat they have, including a pancetta cured by Mazzi’s. So far, so good. 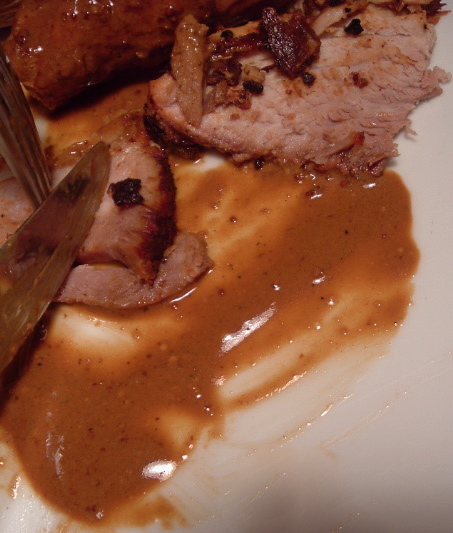 Remove your roast and look at those beautiful drippings left behind. Loosen the roast drippings by adding a cup or so of water. Just plain water. Put it back in the oven until it boils, and loosen up any stuck pieces with a wooden spoon. Let it sit for a few minutes, then strain out the solids with a fine mesh strainer. 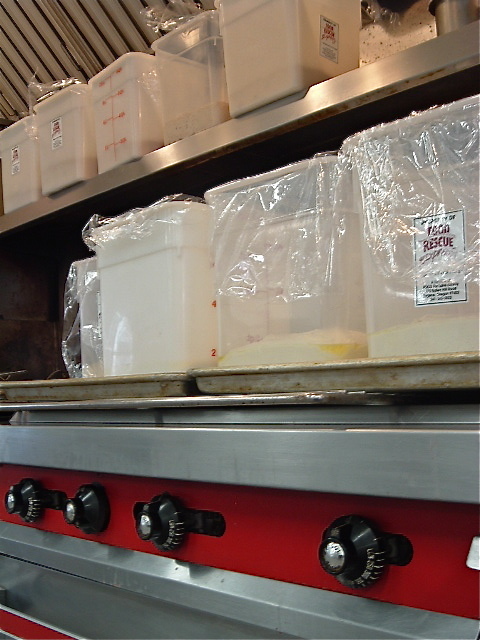 The liquids can go into a small saucepan. Add a bit more liquid if it is really salty and a glug of verjus, vermouth, or white wine. Bring to a boil. Then, and this is the magic, take it off the heat. Add a healthy glob (2 tablespoons?) 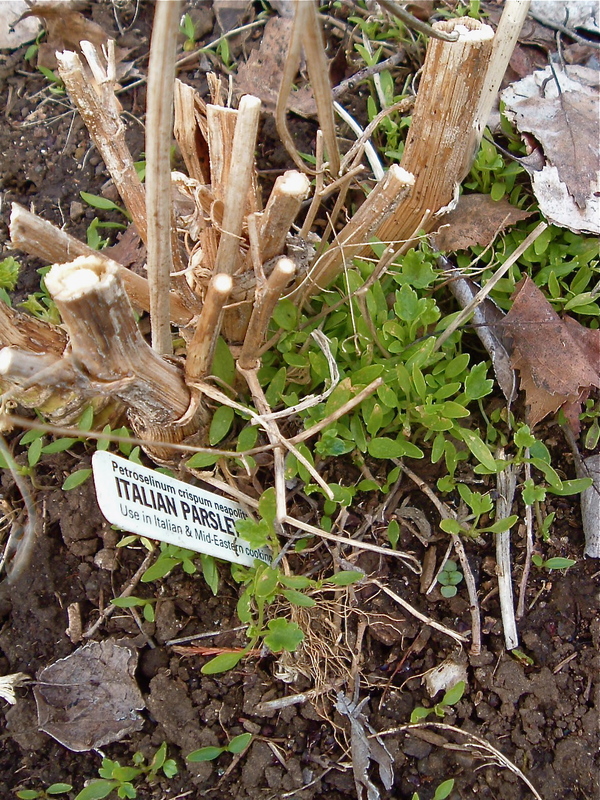 of a stone-ground mustard. Using a clean, large whisk, dip it into your sour cream container until you have about 1/3 cup. Sure, you could use a spoon, but we’re being magic here. Then whisk it into your drippings juice like mad until the white bits are incorporated and whole thing thickens. Taste, and add a bit more sour cream if you like. You can thank me later. I accept gifts of bacon. It’s that time of year again, that donutty time of year which falls on the day before Lent begins. Many Polish-American Catholic families round up the fats and flours in the household and use them to make paczki, the jam-filled donut, and call it Paczki Day. Others go out and celebrate in the streets. Me? Each year, I desperately launch into a Google project to find a Polish bakery, a single Polish bakery on the West Coast, that might sell them to me, and celebrate by going to a crummy donut shop when I fail. Then I write to a bunch of people and wish them a Happy Paczki Day, with my wishes that the next year will bring fat fortune. Yesterday, as I was celebrating in my traditional way, I was pleased to see there is at least one confirmed place in the PNW that sells paczki: a market in Seattle. It then occurred to me that we have a new donut outfit in Eugene. Holy Donuts makes organic, vegan donuts in novel flavors. I had seen the donuts at our local Friendly Street Market, the Saturday Market, Market of Choice, Sundance, New Frontier, The Kiva, and other places around town. 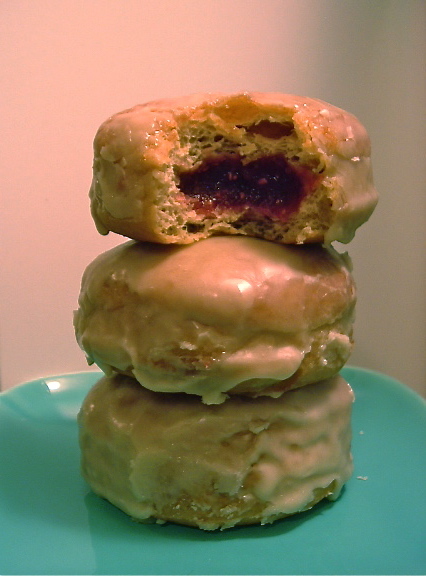 So I gave owner Karen Nunley a call and asked her to make me a dozen paczki-style donuts, filled with raspberry jam. They arrived on my doorstep this morning, and we are finally celebrating Paczki Day in style. The donuts are fresh and cakey, with a filling that tastes of real raspberries and a vanilla glaze. They are very sweet, but I forgive them that, since a non-sweet donut would be ostracized in the donut community. I believe the filled ones need to be special-ordered until Holiday Market rolls around. Karen told me that she’s planning to open up a shop in midtown in the near future. Stay tuned…we might be able to go out for Paczki Day next year! Thanks, Karen, and Happy Paczki Day to all! On the carb front, it was my great pleasure to spend a couple of hours at the Master Food Preservers bread baking class on Saturday. 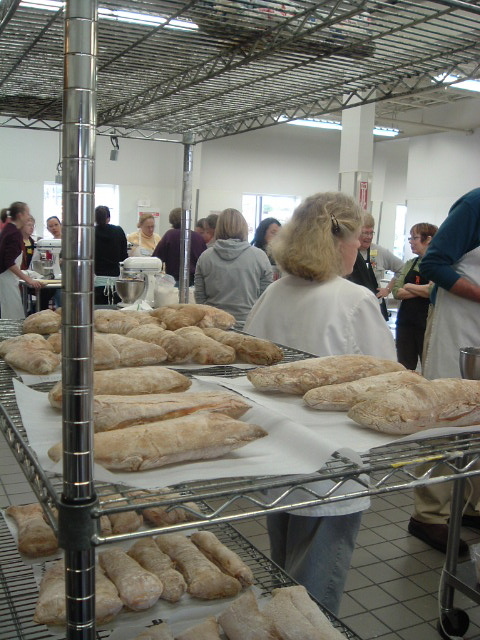 The class seemed like great fun; students were busy making artisan loaves all day long at the wonderful commercial kitchen at Food for Lane County. 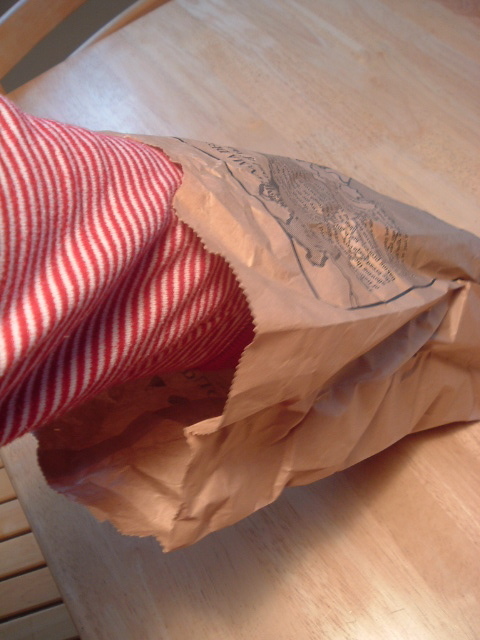 Recipes included a free-form pain à l’ancienne (see picture below), whole wheat bread, ciabatta, a no-knead boule, and traditional Italian loaves. 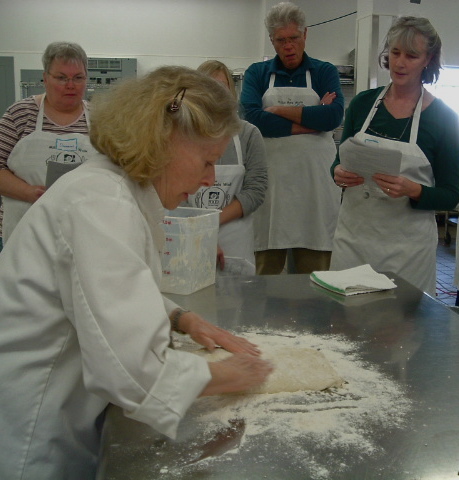 Each group had their own station, set up with a standing mixer and other tools to blend, knead, and form the loaves, and by the time I headed out, I saw many smiling faces with daubs of flour on their cheeks. The instructor, Laura Hindrichs (above), is precise and nurturing, a wonderful combination of qualities in a teacher, and she can bake like it’s no one’s business. There is one more class in the series, and I’m not sure if there is space, but it’s worth calling the MFP office if you’re interested. The topic is flatbreads, and it will take place on Saturday, Feb. 28, from 9-2, cost $35. Laura says it is her favorite of the series. Again, thirty-five bucks. You will never be able to get such excellent, hands-on instruction anywhere else, at any time, for this price. I think it would be hard to find at even double the price, frankly. This is one of the many wonderful programs sponsored by OSU Extension, and one of the reasons I’m such a strong supporter of keeping Extension alive. Oh yeah, and a homemade lunch is included. Seriously, Eugeniuses, if you are interested in cooking, check it out! There are links to future MFP classes to the right. I’ll be pimping the full Master Food Preserver course in a post in the near future…stay tuned. My mom cooked Mexican food when I was growing up, so she always had a pot of beans on. I cook beans the way she taught me. My favorite way to eat them is right out of the pot when they’ve just finished cooking. I spoon some of the beans in a bowl, add a generous amount of broth from the pot, then add chopped tomato, onion, a little chopped jalapeño, and a sprinkling of cheese on top. Simple yet so satisfying! Yum! 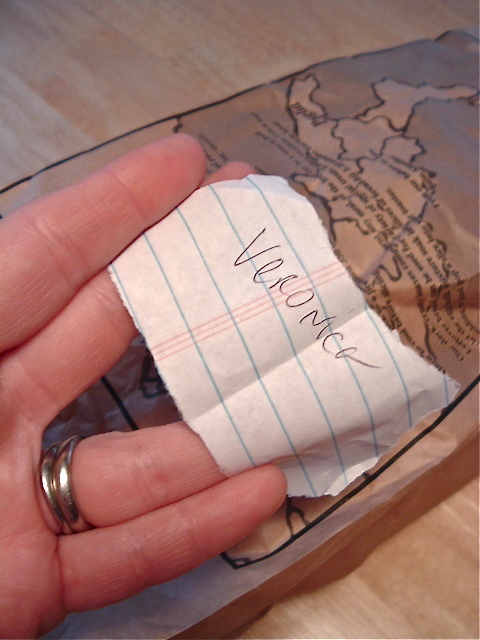 I’d love to hear what else Veronica decides to make with the beans…perhaps a guest post? I don’t know about you, but I’m going to get in a bit of gardening today before the rains return. I’m on a strict schedule of only doing two gardening tasks a day, or else I’d spend all my time out there. Yesterday, for example, I pruned my raspberries and grape vines. Today, it’s roses and ornamental quince. 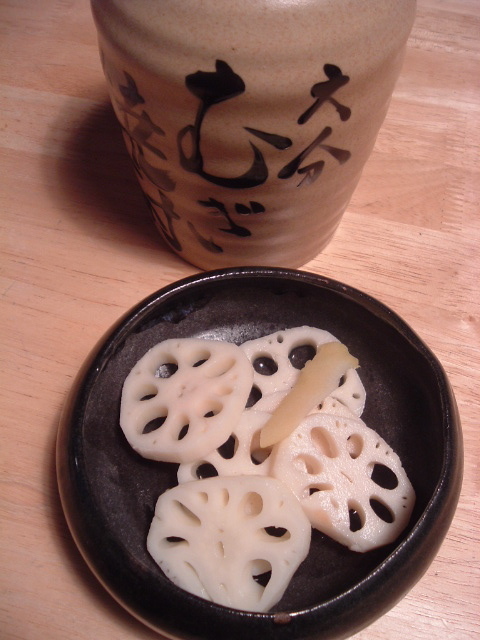 Don’t forget to enter The Great Dried Bean Giveaway of 2009 — tomorrow is the drawing! 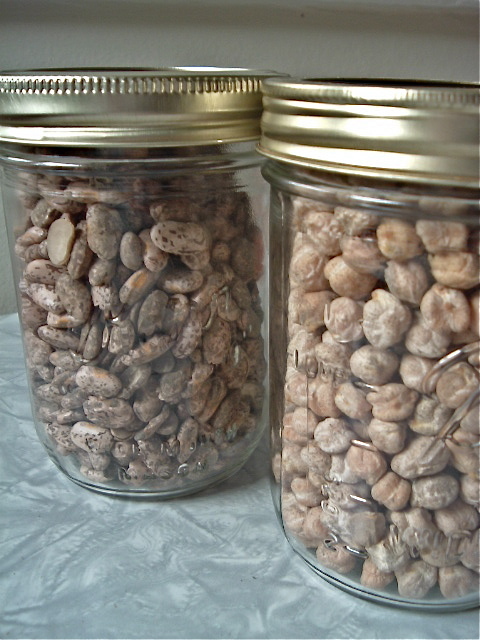 You can win two pounds of delicious, fresh Willamette Valley legumes from Stalford Seed Farm’s 2008 bean trials. Take a look at the comments section for some great recipe ideas. 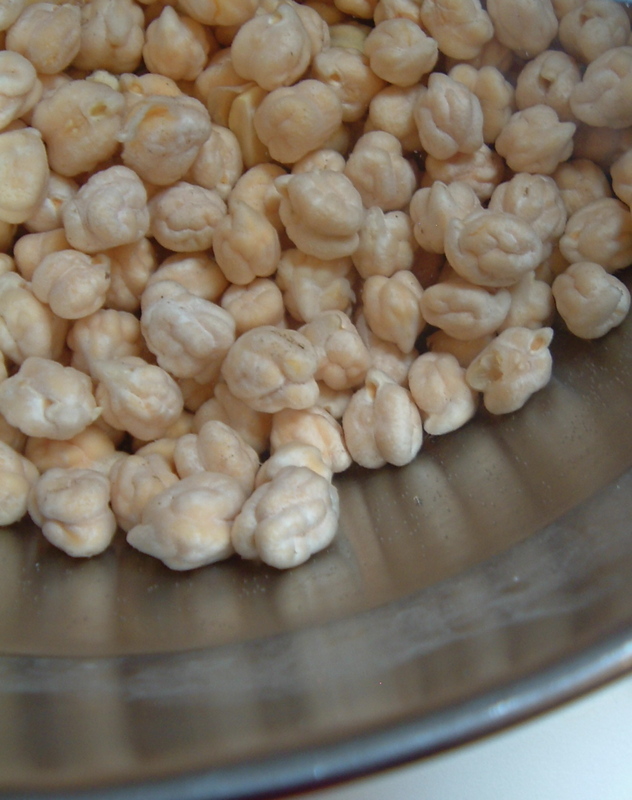 I’m really intrigued by the smashed chickpea salad, the Spanish stew (olla gitana), involving garbanzos, pork, pears (! ), pimenton, picada and chard, and all the dishes made by grandmothers, mothers, and other loved ones. Thanks for sharing those ideas, and good luck! As the final (I think) leg in my bean adventure, I’d like to host my first food product giveaway here at Culinaria Eugenius. I’m a little suspicious of companies that infiltrate blogs to market their products, but I do like the free food sharing idea. Plus, I was generously given these beans to spread the word about relocalization efforts in the Willamette Valley, so why wouldn’t I share the love? a pound of Willamette Valley pinto beans and a pound of Willamette Valley garbanzo beans for you. 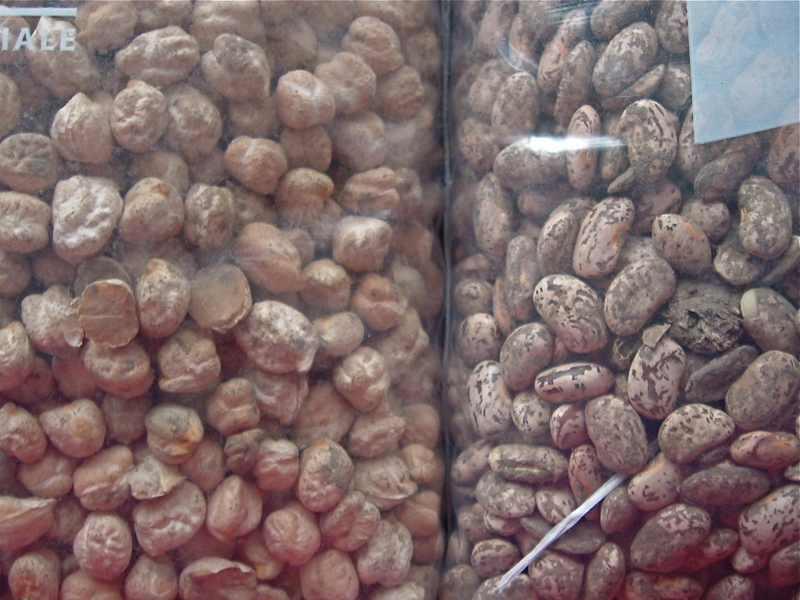 These dried beans will yield around 12 cups of cooked bean pleasure. These little lovelies were raised on a transitioning-to-organic field in Tangent, Oregon, by Stalford Seed Farms. They come fresh from the 2008 crop, and are cloaked in the dark, rich soil from which they were born. (That is, they need to be sorted and washed). They plump up and cook beautifully, yielding tender, sweet, creamy, tasty flesh in a fraction of the time it takes to cook their tough, chalky supermarket cousins. Stalford Seed Farms (along with the project’s visionary Harry MacCormack of Sunbow Farm) is taking part in the Southern Willamette Valley Bean and Grain Project. On their 9,000 acre farm in Linn County, they grow mostly grass seed, but have devoted some of their resources for the past three years to experimenting with food crops, staples such as beans and grains. The 2009 Project report, from which I’ve taken all the figures below, notes that 130 acres have been converted to food crops on the farm (and I believe these are the ones that will be certified organic next year). 400 more acres are being converted, and 1,200 acres were planted with conventional soft white wheat in 2008. It is more costly to grow food, even with the benefits of crop rotation and diversity, and without visible and vocal demand for a relocalized food network in our area, farmers may be unwilling to make the shift. When I visited the farm a couple of weeks ago and spoke with Gian Mercurio, farmer, organic food promoter, and mother-in-law to the farm’s owner Harry Stalford, she shared with me some emails that gave glowing reports of the beans from local chefs and home cooks. I am hoping to share my successes with her, as well. 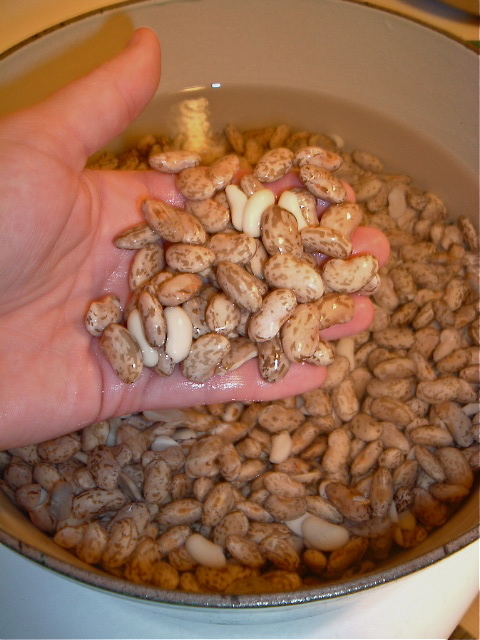 Please comment below if you’re interested in being considered for the bean giveaway drawing with your name, email address (won’t appear on comment field), and your favorite way to cook pinto or garbanzo beans. I’ll write down your name on a slip of paper and do a random drawing a week from today (2/22/09), then contact the winner. You don’t need to live in Eugene or even the Willamette Valley, but I can’t afford shipping costs overseas. The beans will be shipped to you in the finest Ziploc-style bag money can buy.